Music is a language in and of itself, and one that crosses all linguistic barriers between people. It is a sure way to connect your students with another culture other than their own. Our students live and breathe music on a daily basis, and the transfer to another language is there, just waiting to be explored. Having said that, we, as teachers, must use every means available to help our students make that connection, and that does NOT mean using cloze activities all the time. Cloze activities are good, in limited quantities, but there is just so much more than can be done to open those musical connections. I’m going to share some other types of activities that I have used with Spanish music. 1. This is an idea that I adapted from EFL Classroom 2.0, and have used at the beginning of the school year to get my students accustomed to simply listening to a song and reacting to it, without attempting to understand all the words. 2. 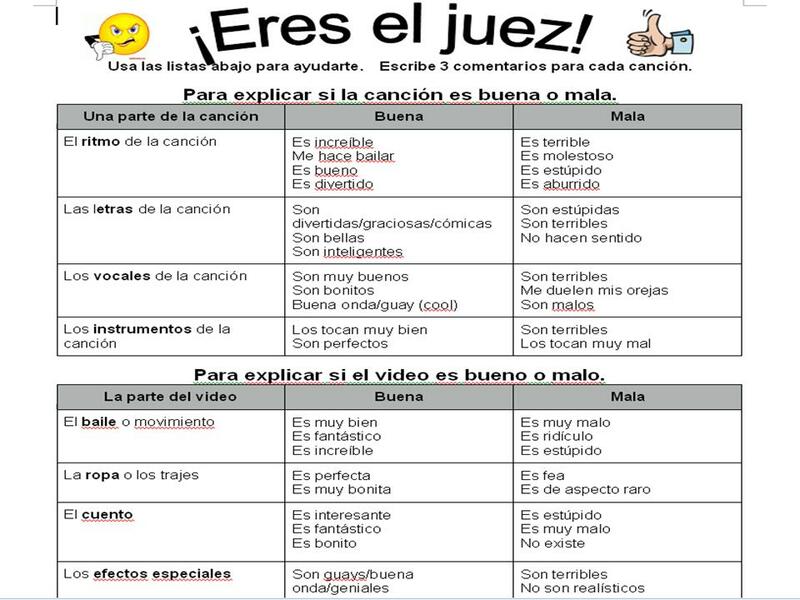 Here is another one, modified, called Eres el juez, in which the students can assess a song, based on the lyrics, the vocals, the rhythm, the video, etc. The image is just a sample. Click here for the file music+critique+you+be+the+judge. This activity can be modified to be used with a SMART board, with a regular board or in groups using index cards. Select a song and target the vocabulary that you wish to accentuate. Create cards for the words to place on a board, or index cards to use in groups, or a SMART board pop the balloon activity with the words. If playing with the whole class, divide class into two or three groups and have each group send a person to the board that contains the targeted vocabulary. If playing in small groups, give each group a set of index cards with the targeted vocabulary. Play the song. The goal is to grab the word from the board, or from the pile of index cards, when you hear that word in the song. The winner will be the person who holds the most words from the song when the song ends. You could use the entire song, or just a verse or chorus from the song. Escribimos (Ojalá que llueva café): ¿Qué quiere decir la canción? ¿Qué describe la canción? ¿Qué es el problema? ¿Qué quiere Juan Luis Guerra? ¿Qué piensas de la canción? 6. I’ve written in previous posts about the EFL activity Last One Standing. I’ve also written about a fruit song. Sometimes I give the students a list of words that may or may not be in the song, and they simply have to circle what words they do hear. Of course, there are wonderful Spanish teachers who are creating incredible activities. Zachary Jones astonishes me just about every day! There is just so much that can be done with a song in another language. Today I have highlighted a few of my ideas. Feel free to use my music database. I update it on a monthly basis, and you can search it by musician, title, grammar, vocabulary, and culture; additionally, links to the youtube video are also provided. I would really love to hear what other activities you have used successfully. 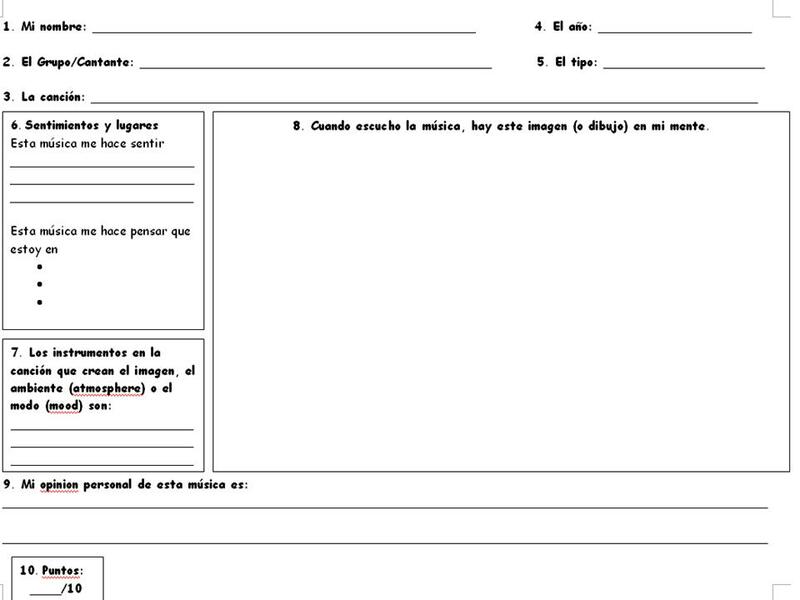 This entry was posted in activities with music, collaboration, creativity, informal assessment, listening comprehension, music, technology in world languages, writing assessments by sraslb. Bookmark the permalink. Thanks for the feedback, Judy! I’d love to know what else you use with music, too! Hi Jane! Thanks for the kind words! And of course I linked to your blog! It’s terrific! I don’t remember when I discovered it, but it has been a while. You always have such relevant, useful items! Hi Jane! I absolutely love the activities that you have so generously shared with us. 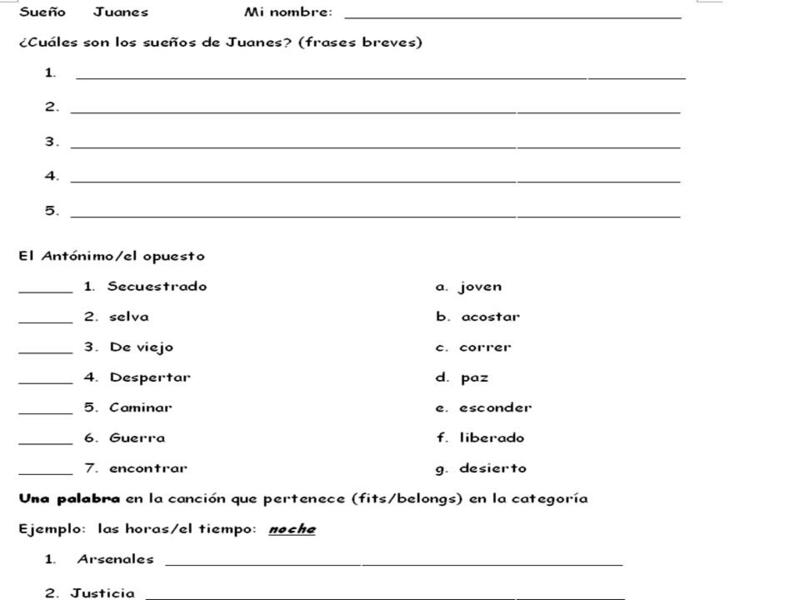 I plan to use the activity about reacting to a song and also the “eres el juez” activity with my students! Just a note: Imagen is a feminine word, “la imagen.” Also, for mood, I think I would choose “humor” or “estado de humor” instead of “modo,” unless you are asking them for the modo subjuntivo or the modo indicativo. Again, many thanks for your generosity and inspiration! Thank you so much…and thanks for the corrections. Sometimes I just get going too fast, or sometimes I’m just not thinking! I will change them soon! Hi, I apologize, but my comment was for sraslb not Jane, my apologies! 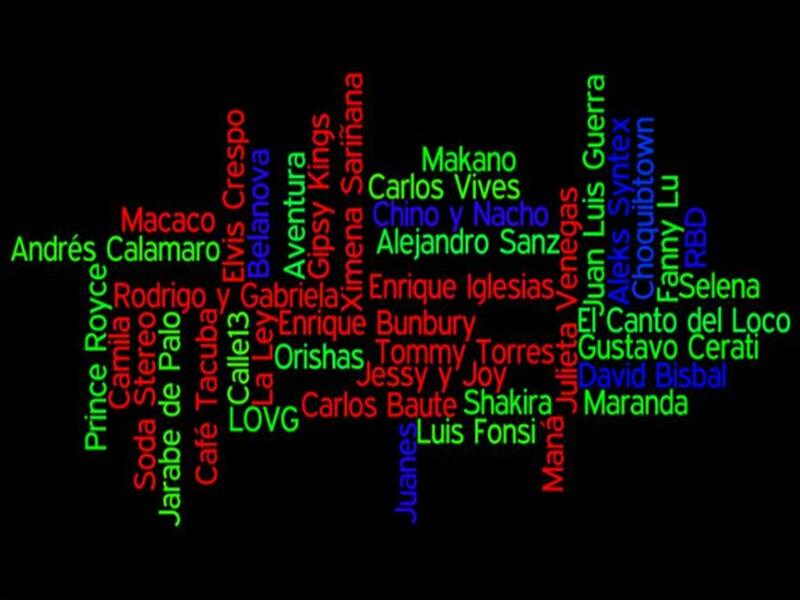 I stumbled across your blog doing a seach for “Juan Luis Guerra cloze activities” and am very glad I did! Great message about music. How can I enlarge some of the activities you posted? I am eager to check out your previous posts and hope to do so soon. I have been following your blog for a while now – love it! Always so much to think about and so much fun to read what you are doing, very inspirational! 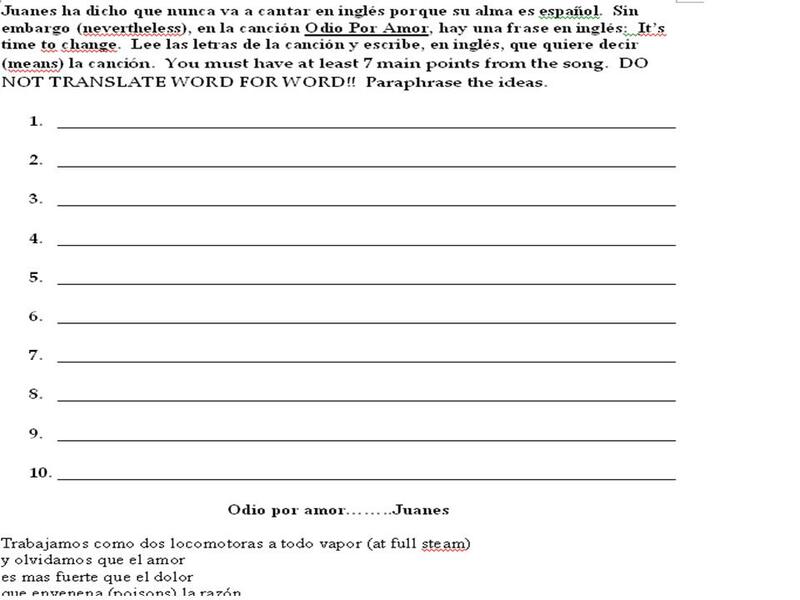 I would like to use the first sheet here not the word wall, (the one inspired by efl 2.0 classroom) but there is not a copy I can print out, would you please share it with me? I’m sorry, but that website has evidently removed the template. I am so happy to have found this post. I do music once a week with my students and have felt so stuck in cloze activities and haven’t been able to come up with ways to take music further considering the limited vocab and understanding of lyrics my students have in Spanish 1 and 2. I love the way music can influence mood and emotion and can’t wait to use the first activity you posted. Thanks!